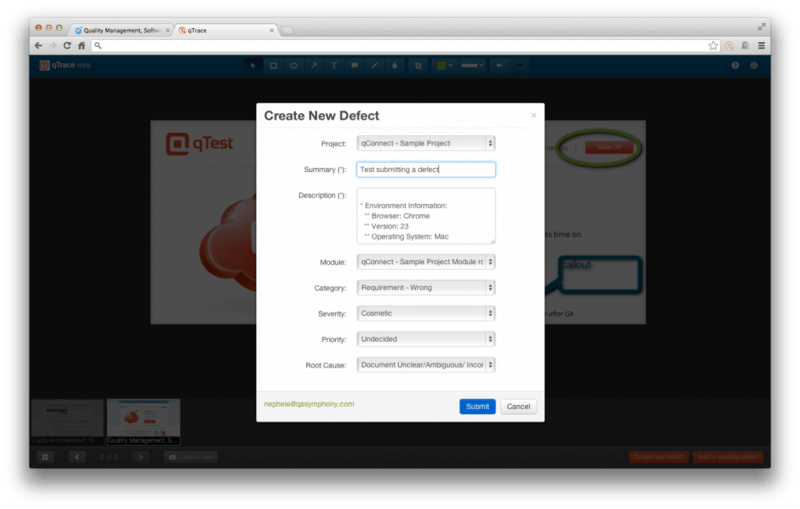 I am pleased to announce the beta release of QASymphony’s latest product: qSnap. This software harnesses the power of modern web technologies to deliver qTrace‘s capability to the web. qTrace Web is installed as browser extension and targets 4 major browsers: Chrome, Firefox, Safari 5/6 and Internet Explorer 9/10 (with support for IE 7/8 coming soon) and runs on Windows, Mac OSX and Linux. The current version of qSnap supports integration with qTest, our quality management platform (which is also in beta right now). 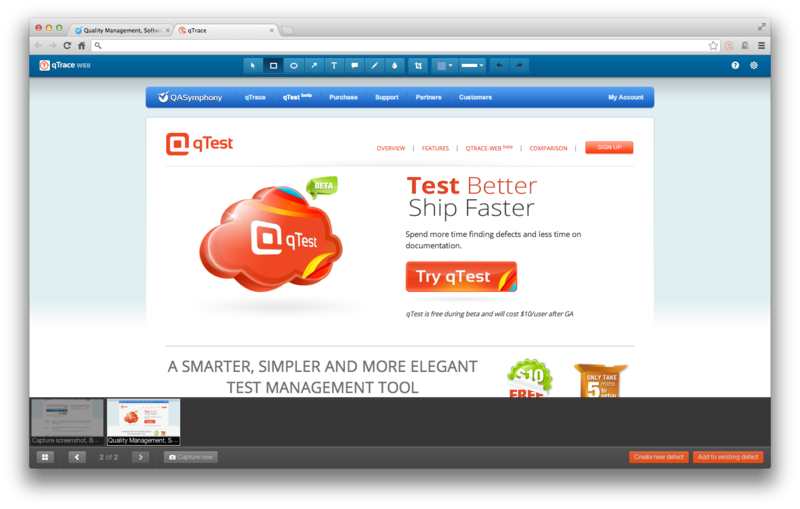 Using qSnap, you can easily capture screenshots of the website under test, annotate them with a variety of annotation tools and directly submit defects to qTest. All without leaving your browser. The following screenshot shows how qSnap looks like after capturing a couple of screens from QASymphony website. From here, you can easily annotate the screens by cropping them, blurring sensitive information, adding callouts, texts or drawing arrows, rectangles, ellipses or free-hand shapes etc. Once done with the annotation, you can submit a new defect or modify an existing defect with those annotated screenshots attached to qTest. Note that qSnap automatically captures environment information such as the browser and operating system being used. Download and try qSnap today and let us know what you think about it. 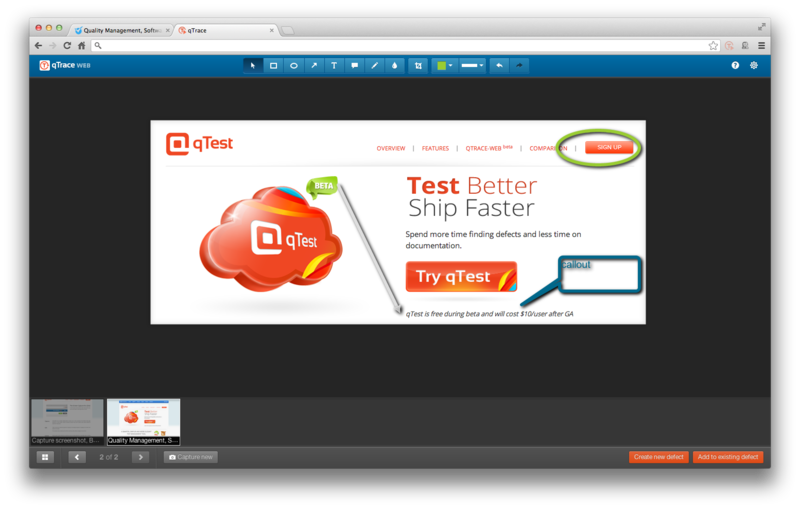 You can also register for the free qTest beta account to check out the integration between qSnap and qTest. Hi, regarding qtrace-web, is it also possible to report qtrace-web screenshots & comments to 3rd party softwares, such assembla? @Guillem: it does not currently but we do plan to support other trackers in future release. I see a case where screen is flickering as soon as i launch QTrace. What might be the issue and what would be the solution for the issue?